In computer graphics very often you want to know how big an object looks in screen, probably measured in pixels. Or at least you want to have an upper bound of the pixel coverage, because that allows you to perform intelligent Level of Detail (LOD) for that object. For example, if a character or a tree are not but a couple of pixels in screen, you probably want to render them with less detail (as in stochastic pruning of leaves for example). 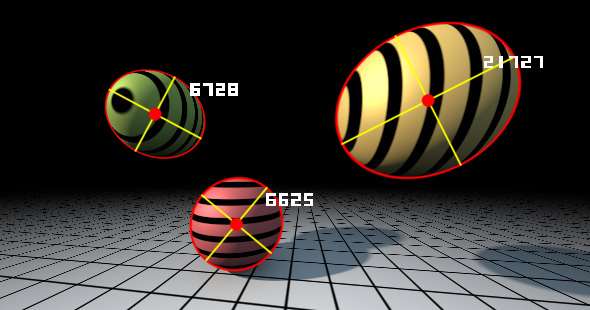 One easy way to get an upper bound of the pixel coverage is to embed your object in a bounding box or sphere, the rasterize the sphere or box and count the amount of pixels. This requires complexity in your engine, and probably some delayed processing as the result of that rasterization won't be immedaitely ready. Modern hardware allows for conditional rendering, but still, the technique can only be applied in some cases. For example, it would be cool if a tessellation shader or a geometry shader would be able to tessellate or kill geometry (tree leaves) on the fly based on the pixel coverage of the object, just immediately. Well, luckily for us there is a solution! The pixel coverage of a (bounding) sphere happens to have analytic expression can be solved with no more than one square root, it is very compact. I'm not sure why this is not used more often and is not more documented, because it is super helpful, or so I find it for my demos. This article is about this analytical and fast bounding sphere screen coverage calculation. Enjoy! and this is a quantity always smaller than zero as long as the sphere doesn't contain the origin/camera, and as long the Z component of the sphere origin and eye point are separated by at least the sphere radius. So this inequality flags all the points in the plane (pixels in the screen if you want) that will get a projection (will get rasterized) by the sphere. Now we have to find a way to count those pixels! Once the rotation is performed, and once the axis of the ellipse align with the coordinate system, meaning the ellipse conforms to the standard form, one can proceed to compute the length of the axis and the area as usual. In the way there quite a few nice simplifications that happen, but I leave that as exercise to the reader ... (or look up the code in the Shadertoy link at the bottom of the article). A realtime interactive implementation of the code above. Move the mouse or press "play". Click in the title to navgiate to the source code.